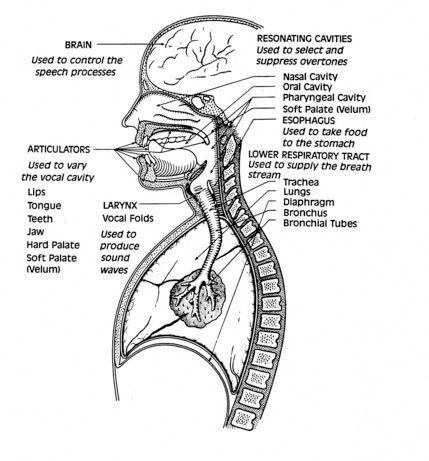 It’s funny, how little we know about the mechanics of the human voice. Until you decide to study it, you pretty much know what you know from how you’ve used it. In my case, I’ve been taking voice lessons since high school… then I took extra curricular training at the Ottawa School of Speech and Drama… the Trinity College London… then it was off the theatre school at Sheridan College in Oakville and the University of Toronto (Erindale College.) I’ve been working with my voice a good long while. As you may have read, I’ve only got one working vocal chord. Some may see this as a challenge, but I’m weird: I took it as an opportunity to get to know my voicebox and breathing and resonators intimately. Rather than talking to you about text book exercises and warm ups (stuff they cover in singing classes) I;m here to help you get to know your instrument. You’d be amazed what you can do when you actually truly listen to what happens when you fully explore all the bits and pieces that make up your singing apparatus. Do you have any questions? Let’s meet up so we can talk about things and figure out what we can do about your singing chops:together!